Perhaps dissociation from the human — the particular, the subject — is part of the post-postmodern project. But perhaps this worry about dehumanization is an early stage of understanding the digital humanities. One of the greatest changes that happens when you work with digital information is that you gain the capacity to perform large scale computation. That’s what the human brain is less good at, but that’s what computers do without breaking a sweat. So it’s only natural for many of us to subconsciously or consciously define “digital humanities” as highly computational and as primarily preoccupied with massive aggregates even when this definition does not describe all that is going on in the field. Timothy Burke rejects Fish’s dehumanizing view of the digital humanities in his wonderful essay, The Author is Human. “In DH, authors are not dead, just brought down to human scale,” he writes. Authors aren’t the cultural monoliths of the pre-digital humanities — great minds that dominated the minds and imaginations of their times or ours. Authors are just… authors. In a sea of other authors, each one authoring away, any one author is uniquely that author. It’s just that that author’s intentions and effects do not completely overshadow other authors’ intentions and effects. In a way, I think Burke is saying something similar to what I said about focal flexibility. 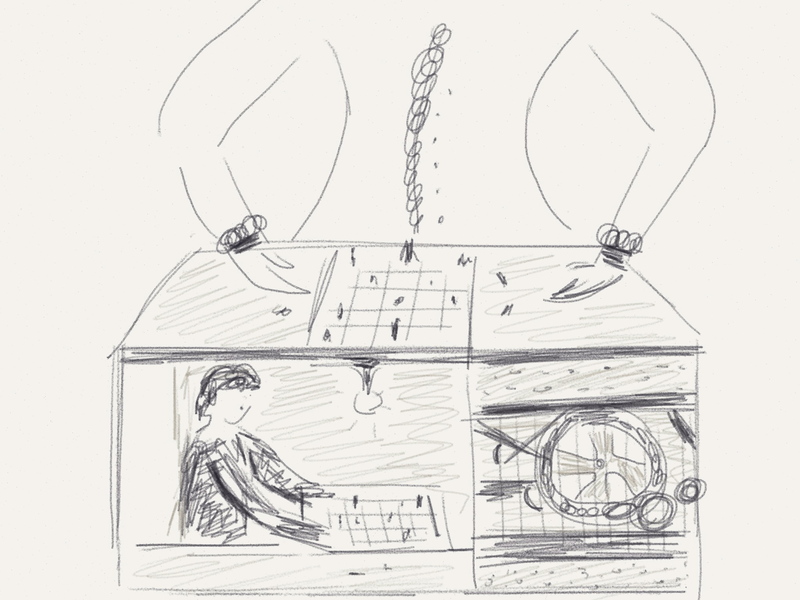 My sketch of a Mechanical Turk. So maybe the object of study is still fundamentally human, or at least not necessarily dehumanized, but maybe the praxis itself is less authorish than it was before. Maybe there’s often too much resistance in the materials, or too much of the wrong sort of resistance, making the whole enterprise feel less like communing with other minds over time and space and more like fighting with computer code and mechanics. Of course, the real work of human-computer interaction draws on the complementary strengths of mind and algorithm. Shyam Sankar’s TED talk on human computer cooperation demonstrates this beautifully leaves no doubt that even highly computational work still relies heavily on human intelligence and design. Perhaps the very nature of the work itself, relying as it so often does on teamwork rather than a lone thinker, reduces the sense that the scholarship is as purely Authored. So much of the ethos and identity of the humanities is wrapped up in the idea (the myth?) of individual scholars thinking deeply and carefully about their subjects. With that as the backdrop, assertions like Beth Nowviski’s, that “the great project of humanities computing is the development of a hermeneutic—a concept and practice of interpretation—parallel to that of the dominant, postwar, theory­ driven humanities: a way of performing cultural and aesthetic criticism less through solitary points of view expressed in language, and more in team­based acts of building” sounds uncomfortably de-centering (Said in the Chronicle of Higher Education, and on her blog). It’s easy to feel as if this type of work places less value on the self of authorship and scholarship. And in this case, any individual’s ownership of intentions and effects really is open to more disruption and dilution by the very nature of working as part of a team. Traditional humanities relied on more than one scholar as well, of course. Acknowledgements sections attest to this, but even without them we know from experience that knowledge doesn’t spring full formed from a brilliant mind in a vacuum. But more and more projects, particularly in the digital humanities promote team members from the acknowledgements to the author line both in form and in deed. The selfhood of individual authors can no longer be seen (in fact or in myth) as fully owning their intentions and effects. Even so, truly collaborative projects rely heavily on the spark of individuality that each partner brings, the rich tapestry of backgrounds, experiences, and predispositions that allow one partner to see facets of a project that the other partner would never have seen, or seen too late. This is what we wanted to spark off in our Digital Humanities Speed Dating event. The human, it seems, is anything but an amorphous digital collective in the world of digital humanities. Both the subject and object of scholarship in the field rely on and celebrate the individual. This does not mean that things are the same, though. Authors are less monolithic things now, it seems, less singular. And right now that feels unsettling, particularly as we’re getting used to the whole idea and while the digital piece is so relatively new that it needs modify the term “humanities.” Perhaps as things settle into normalcy the word “digital” in the name won’t feel so inhuman, or perhaps we’ll dispense with the modifier altogether. However things evolve, though, it will be fascinating to watch the role of the self, the author, the human as it navigates the space of the digital humanities.